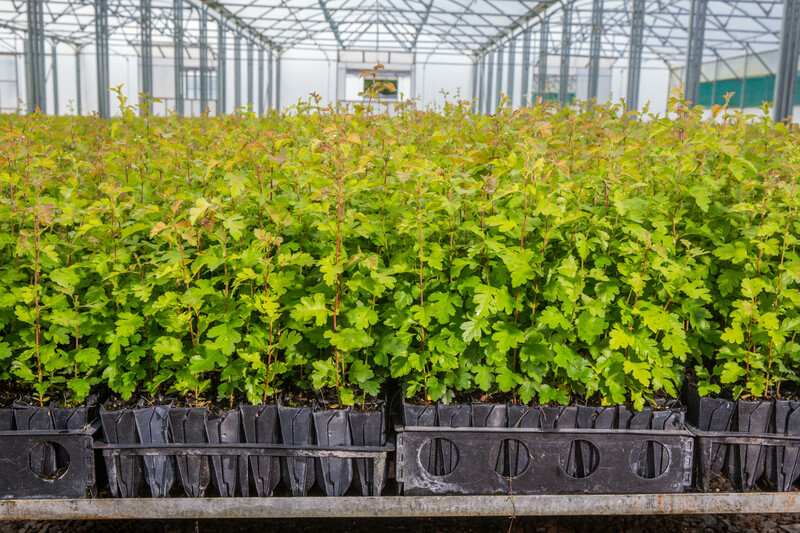 At Alba, we want to produce the best trees of any UK forest tree nursery by focusing on quality, so all our plants are cell-grown and UK grown. You need not worry about imported plants cross-contaminating home-grown stock on our nursery and we are the only major forest nursery in the UK to offer the 100% Home Grown, Cell Grown guarantee. Our ethos of quality is reflected from our Research and Development, through plant production and onto Customer Service and Delivery. It is all the details which make the difference, from getting the very best seed, to bespoke packaging to having a forklift on our lorry to speed unloading. We are continually innovating to help our customers, from our Alba bags which help preserve plant quality to the market leading Albacote fertiliser. If it’s not quality, we don’t do it. Our trees have higher establishment rates with fewer losses, due to the root systems being complete. Replacing dead trees can be very expensive due to labour costs, so it normally pays to get it done right the first time. Which means using cell-grown trees. Our plants do not ‘check’ on planting so there is rapid early growth and less risk of weed competition. Bare rooted trees often take time to settle into their site as the severed roots must re-grow. Our containers are designed to eliminate root spiralling, enabling stability once planted. We select container type according to species and carefully consider the effect of this choice on ‘lazy rooters’. Our packaging systems have all been designed to allow for careful handling of our plants and prevent root damage, which is the primary cause of poor establishment. Our bespoke traceability system ensures that you know what you are getting. Our plants remain in their growing containers until orders are called up, so we can react more easily to unexpected delays in your planting scheme. Even when you do get our plants delivered, they can remain stored on the hill for much longer than bare rooted trees because of our root packaging and Albabag systems which retain moisture around the roots and shield the plants from wind. Drought can be a major issue so it is always advisable to plant trees upon delivery, but at least with Alba’s cell-grown trees you have the option of delaying if necessary. Because there is no damage to the root systems, our plants do not need to be dormant when they are planted. So you can plant throughout the year, which can be a comforting thought when so many other factors can cause delays. We would advise not to plant during drought conditions, so only plant after May if we are having a traditionally wet British summer. They are easy to plant and little if any ground cultivation is required. The introduction of cell grown trees to UK forestry in 1988 has allowed us to plant in areas where bare rooted trees struggled to establish. 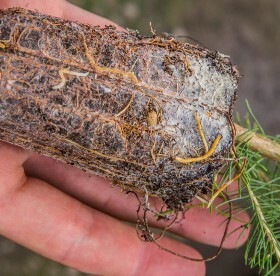 The root plug contains both naturally occurring mycorrhizae ( a symbiotic fungus which enhances the absorption of nutrients by the feeding root hairs) and added fertiliser.